With Easter around the corner, I've decided to focus the next two forum events (yes, two!) around all things Easter. 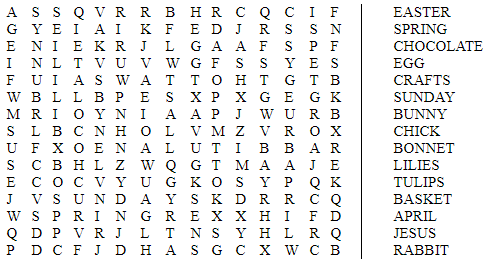 If you want to bag yourself some forum VIP, all you have to do for this easy competition is to find all of the words in the wordsearch below. You can use Paint or Lightshot (or anything else) to circle/cross through each word until they're all found. Then PM your completed wordsearch to me on this link with the title as Easter Wordsearch. Every entry will be randomised to reveal a winner who will bag themselves 2 weeks of VIP, with another randomised entry to win themselves 1 week of VIP! All staff are welcome to join in on the event, even my moderators. This event will close on the 17th of April. These Easter events are the last chance of winning VIP without paying for it! After these, the prizes will go back to Exclusive. The last forum event for Easter is coming next weekend, stay tuned! Bump x Closes tomorrow lunchtime! You've been given your prizes. The last Easter event comes out on Good Friday. Thank you for playing!